Hello People, Elego’s back! Digiflavor Drop RDA, with the Standard and BF squonk 510 pin, features the 4 large post holes allowing for easy coil placement, and maximum build space with open access to trim excess. With the Stepped airflow design, Drop RDA provides the dense flavor. 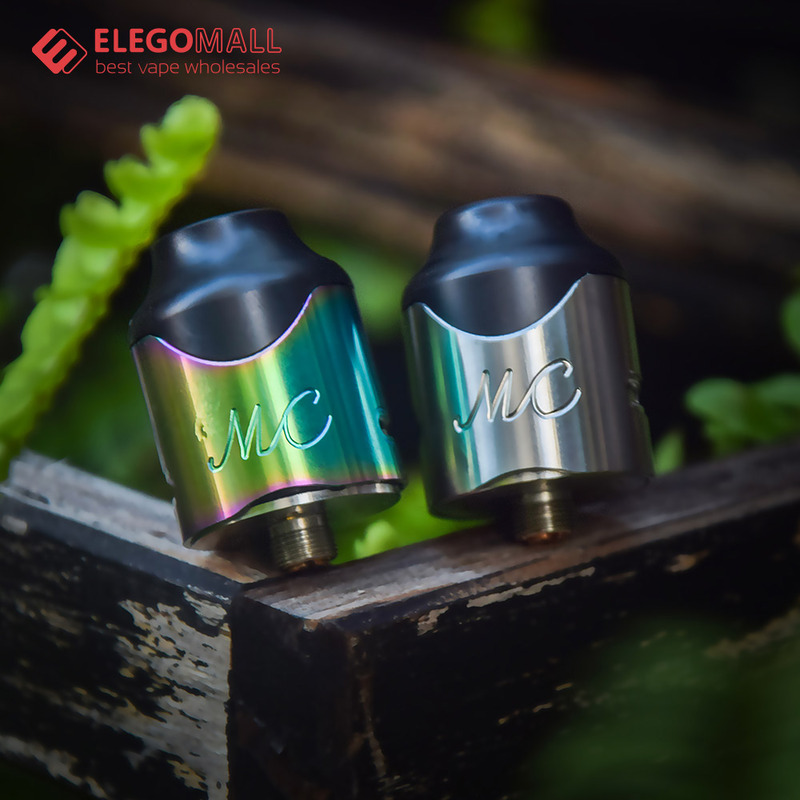 There gonna be a lot of reviews on this huge deep spacious juice well tons of room for liquid the digiflavor Drop RDA,available now in Elegomall ! Last edited by Pheric; 11-10-17 at 08:10 PM. XOMO GT Laser 150W Box Mod, 0.02s quick fire button reach your desire temperature without limitation. For vape users who persuit for fashion design and different function, you shouldn't miss the transparent and piano paint processing appearance, not only cool as it seems, but also ensure durable usage for daily. With the built in 3500mAh lithium battery, it sustain long time vaping experience without worrying about running out of battery halfway. portability, but also for the fabulous flavor and exclusive design comes within. It features unique necklace wearing all in one device, easy to charge, take it everywhere you go without any limitation. Besides a tons of colors to choose from, it offers you customized color pattern for your own style. Everyone is unique, vaping experience will not let you down. Login to get a better deal at $21.76, high qualified device with reasonable price. One more thing I forgot to tell you, this device is exclusive sale at Elegomall. Last edited by Pheric; 12-10-17 at 02:58 PM. Hello guys ,Elego’s back again with Reuleaux RX2 20700 kit from Wismec, the updated version of Reuleaux box mod, is compatible with both 20700 and 18650 cells. Having a large 1.3inch display and easy-to-go interface, the RX2 20700 is capable of firing up to 200W with dual replaceable cells. The GNOME atomizer that packs the powerful WM coils for optimal flavor and retractable top design for convenient filling can perfectly pair with RX2 20700 in terms of appearance and performance. This is the RX2 20700 kit compatible with Both 20700 and 18650 Cells with Compact Size and 200W Max Output, not to mention the 1.3inch Large Display with 2A Quick Charge and Powerful WM Coils for Huge Vapor and Optimal Flavor.Welcome this newbie of RX lines on Elegomall.com ! With all kinds of starter kit on the market, which one do you like the best? Joyetech rock you with another nice hot selling starter kit Exceed D19! It provides scientific the airflow options, three smail airflow options for your own airflow preference, it allows wide open as well. In this term, this devices support direct lung to mouth to lung for users. The rubber under airflow control ring is really nice. Beautiful smart appearance for both business and casual occasions, the flavor will definitely amaze you. I am not telling you it brings out great taste with wine. Although it's a compact device, you will find everything you need within this kit. Feel great in hand and don't miss to grab one! The teardrop design make it an exclusive one at the market. If you want a sleek, stealthy vape mod that perfectly fits into your pocket and right in hand, suorin drop starter kit is definiely the one for you. Not only are the aesthetics on point, but also the minimalist design lends itself to simplicity by an intelligent temp sensor tucked inside the tiny device and an on/off button to minimize accidental firing. Vaporesso Swag 80W Starter Kit, adopted IML technology to this new device. This item is powered by single 18650 battery and up to 80W maximum output, which is powerful to supports long time vaping. Upgradable Omni 2.0 chip will bring you better flavor with any juice you put in. Several mode options include VT, TC, VW, and Smart modes to choose from when vaping. Paired with the NRG SE Tank with twist Open design, smooth adjustable bottom air flow, it keeps the same universal compatibility coil selections. This is truly a swagger piece. Last edited by Pheric; 13-10-17 at 07:26 PM. Hello boys and girls, Elego’s back ! We are gonna to check Tesla Punk 220W Box Mod is a retro style box mod produced by Teslacigs with the design of punk style, which is a great hit to those vapers who like the style of punk. Made of zinc alloy, ABS and PC, Punk 220W Box Mod is designed to provide you with premium touch feeling. Vaping data will be displayed on the bright OLED screen. Also, it has RGB LED lights built-in with five different lighting modes. Multiple modes including Ni/Ti/SS/TCR/KA are avaible to choose. So what’s on your mind about this dope mod people? It’s a good amount of power ,it got temperature control and heavy zinc alloy body feels ergonomics nice good job from tesla again.Come on to get the funk retro belongs to your way in Elegomall ! Last edited by Pheric; 13-10-17 at 08:31 PM. Smoant RABOX 120W Mini Mod, a futuristic sic-fi mod to fulfill your starwars dream! It's absulutely a high-qualfied designed mod with extremely pure vapor production you ever expected. The transparent craft design enables you to see everything inside. Besides, the waterproof PCB make it sustain normal function even in bad condition. The RABOX has a built-in 3300mah capacity battery suppports long time vaping and can reach up to 100W maximum power output. HorizonTech Arco 2 Tank fits perfectly on that. HorizonTech Arco 2 Tank is the innovative Flax paper coil tank. With the Arco 2 T6 coil, the set up time is faster and the taste will be better than the 1st generation arco. Compared to the traditional cotton on the tank, the flax paper takes advantage of water absorption and beathable feature. It absorb e-liquid and brings out best performance of juice.The 3-layer-liquid-guiding system will bring you even a pure and dense flavor. There is a vacuum-plated colorful glass tube and resin drip tip included in the package. 6 colors available. Last edited by Pheric; 14-10-17 at 08:07 PM. Squonker Box battle: Lost vape DNA75C, Vandy Vape Pulse, Stentorian RAM, which one you like? Hey folks, have you met your ideal box? Bf squonker box brings out a hot trend for a while, I bet a lot of you have grabbed them for daily set up. Among all the squonker*box around the market, which is the one for you, what characteristics are you looking for? Here we have listed out some of the squonker box for you. The Lost Vape Therion BF Squonker DNA75 Mod appears to be one of the most efficient output devices with high-performance capability of Evolv's DNA75 intelligent chipset. Evlov's chipset won't be unfamiliar to most of vapers, it brings out the most original, pure, and fabulous flavor on any juice you put on. The Therion BF Squonker comes with a standard output range from 1 to 75W and an incredible 85% efficiency ratings and sophisticated customization ranging from full temperature regulation to personalized screen options. In addition, with various color and material pattern out there, you may customize frame and leather at your preference, which is an extra point for this product. Vandy Vape Pulse BF Squonk Box Mod fits for both 18650 and 20700 battery.This device comes with*built-in 8ml food grade silicone bottle, which will satisfy your need for vaping all day long. This build-up*makes it easy to refill and carry as well. *Meanwhile, the front panel and back panel of the Pulse BF mod can be replaced at your preference. Featured with universal spring loaded 510*thread, most atomizers will*be compatible on that. If you are looking for a compact size, easy refill, safe and fair price one, the Vandy Vape Pulse BF mod will be a good choice for you. Stentorian Vapor RAM BF Box Mod, is a wood/resin, kind of old school creation that has been designed to be a mid-range squonking mod that is suitable for a wide vaping audience. This nice cool box houses with a 7ml capacity bottle internally and is powered by a single 18650 cell for your convenience. Besides, it features safe lock fire button system to prevent any mistaken*startup. What kinds of information you would love to know? Which product do you feel interested in? What do you like to know about vaping? Which is your favorite among all? Last edited by Pheric; 18-10-17 at 02:21 PM. Hey folks, how is everyone doing? I'm so glad to see Autumn is finally coming, the best season in a year! How about hang out for the Autumn leaves view, have a pleasant pumpkin festival, find out the most charming moment for this harvest season. Has that ever bothered you that vape devices you have seem to be too large, inconvenient to carry? Then won't be a problem any more. We find out these compact, fashion, elegant items here. It fits any occasions you go no matter you are at office, in a club, or hanging out with friends outdoors. Check out what we got for you. Frist we wanna introduce you a new released nice device here: XOMO Mimi 2018 Kit. Being created by the designer of Smoking vapor Mi-one Kit, this device seems to adopt all the beautiful features Mi-one carrys: great looking, convenient, fabulous taste. Cater to the need for vapers for both indoor and outdoor use, XOMO brings out nechlace design, hold it, wear it, or take it as you like. If you have a passion for fashion, you will find the beauty lies in necklace and pattern design. For whom are not satisfied with all these patterns it carries, they even provide customized pattern choice just for you. Get your own exclusive vape at your option. Given all the functions it features, the price is also competitive. Besides, it is exclusive sale at Elegomall. The ARTERY Lady Q Kit, is a discreet and special vaporizer designed with women in mind. With a lipstick-style design, the Lady Q perfect fits in a purse or handbag. Feels great in hand, you can take it anywhere you go without limitation. Lady Q Kit comes with the build-in 1000mah battery and 1.5ml capacity, small as it seems, it supports the output and juice capability for whole day vaping. Available in three vibrant colors, the lady Q is an expressive vaping device with a classy appearance that doesn't sacrifice quality. The lady Q is a modern vaporizer for the modern woman. Suorin Drop Starter Kit, appears as a revolution in ultra-portable vape kit. Designed in a teardrop shape, you will find the appearance quite unique around the vape market. If you are looking for a sleek, stealthy vape mod that easily put into your pocket or hold in hand, that will meet your expectation. Not only are the aesthetics on point, but also the minimalist design lends itself to simplicity by an intelligent temp sensor tucked inside the tiny device and an on/off button to minimize accidental firing. A lot of new items are coming on the way, please stay tuned at ELEGOMALL. By the way, Halloween is coming, are you expected? Last edited by Pheric; 17-10-17 at 10:08 PM. Vandy Vape Mesh RDA vs SMOKJOY Mushroom vs Tigertek Morphe, which one you prefer? What are you using for daily set up? We are always trying to find atomizer meet the most pure, dense, desired flavor. Have you find yours yet? Here we got most recent hot items for you, check it out what are they. Vandy Vape Mesh RDA just came back with new color (Blue) this time! It is a 24mm, rebuildable atomizer with dual clamp style postless build deck, which allow for both mesh and standard wires. The special dual invisible clamp style postless build deck features two 11mm terminals with side mounted flathead screws to secure the coil leads or mesh. Airflow enters the Mesh 24mm RDA via dual adjustable side airslots are compatible for either single or dual coil builds. Its dual airflow slots can be adjusted using the top airflow control ring. KA1, Ni80 and SS316L mesh wire is included for your convenience. Besides the Mesh RDA itself, it comes with two 9mm drip tips, one ULTEM and one Doc drip tip, a 510 drip tip adapter, and a bottom feed pin. The Mesh RDA brings you an unique and versatile system for a fabulous vaping experience! SMOKJOY Mushroom RDA is a rebuildable drip atomizer with 24mm diameter. Both sides of the base has been divided into positive and negative poles so that you may install the heating wire with free combination. The MC RDA has a dual side airflow slots, which brings out satisfied vapor production. In addition, the distinctive POM drip tip has an outstanding heat insulation effect which allows you to have a better vaping experience. The mushroom RDA has appealing beauty from outside and high performance from inside, stunning colors gives extra point on the product. 4 colors available for your selection. 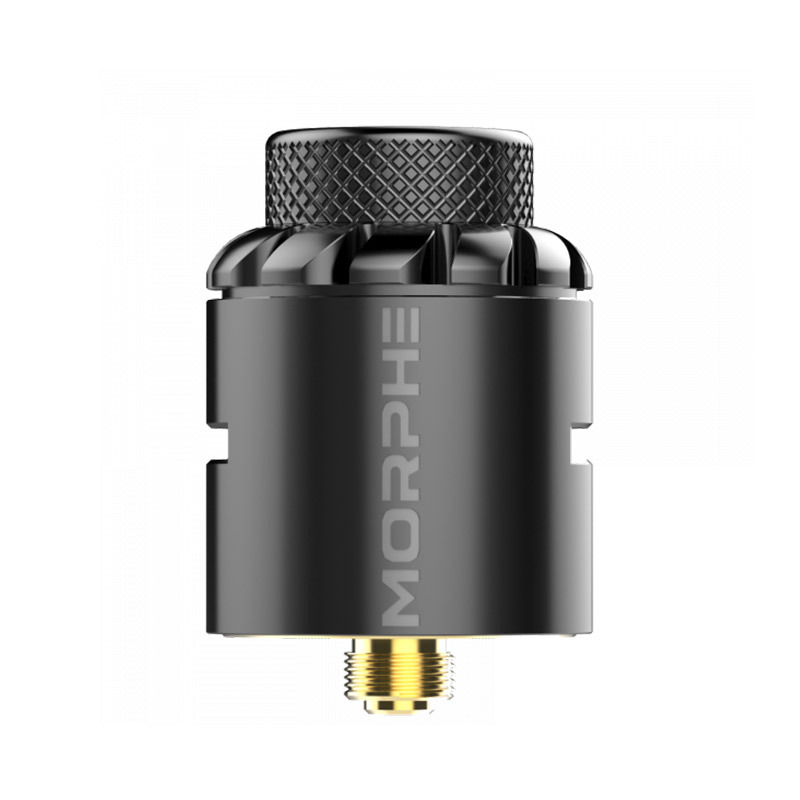 Tigertek Morphe RDA is an innovative,visually striking, 24mm diameter atomizer from Tigertek. Adopting a versatile, screwless post deck for optimal coil building enjoyment, this single coil atomizer is designed to bring out smooth and optimal flavor outputs on any juice you carry. Side airflow inlets channel airflow directly onto the installed build and can be easily adjusted for more or less restriction as preferred. The RDA is also compatible with 510 and 810 drip tip with an adapter. For better price, event, and special deals, please stay tuned at ELEGOMALL. Last edited by Pheric; 18-10-17 at 06:26 PM. Thermo RDA by Innokin is a rebuildable drip atomizer with a two post clamp style build deck, redirected bottom airflow, features a 810 proprietary drip tip, a bottom and side airflow system and an innovative gold section in the middle build for anti-spit back. With a large build deck and 2.5mm post holes, avid builders are able to install all of their favorite coil builds with ease. That fits juice well for better vapor production and a wind storm system that helps users deliver satisfied clouds while maintaining flavor. 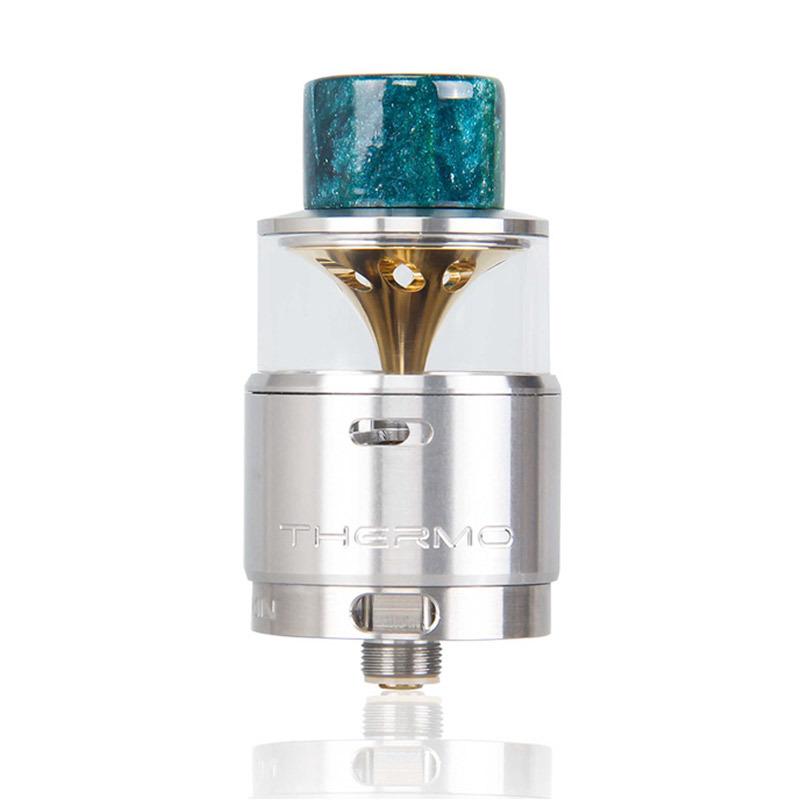 The outside of the Thermo RDA, features an adjustable mid airflow control ring, and a non-adjustable bottom airflow. Innokin Thermo RDA is a beautifully designed high end atomizer perfect for those looking for a larger RDA for large format coils. Sigelei Fuchai Squonk 213 Kit is the perfect combination of Sigelei technology with the beloved squonking vape style. This squonker can not only save your trouble of dripping, but also it is compatible with 18650, 20700 & 21700 battery. 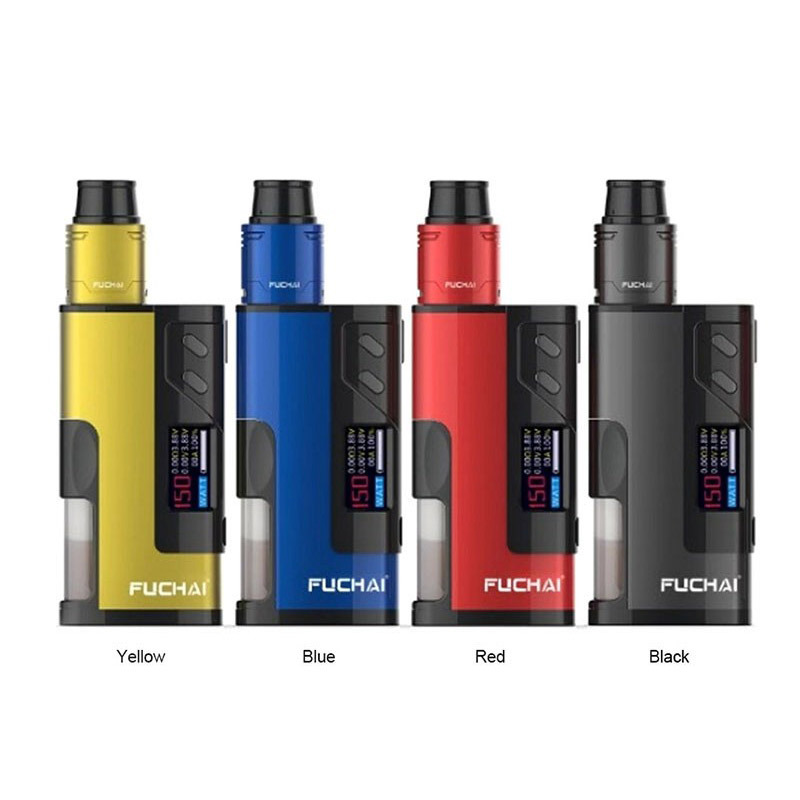 When using Fuchai Squonk 213 with the super power 21700, the maximum wattage goes up to 150W! The unique design include double fire buttons, replaceable rubber ring, volta adjust mode and square tank. You may find dripper wicks wet is a thing of beauty, the soft squeeze material bottles which house your liquids will push your ejuice of choice right up the chamber and goes into your build decks. Now you can vape from a dripper without carrying around a bottle of juice with you. You will meet your desire flavor all day long. Find your favorite settings and vape away. IJOY CAPO Squonk Kit are composed of a CAPO Squonker MOD and a COMBO RDA Triangle. This item is compatible with 21700/20700/18650 cells with 100W maximum output. There are a lot of single cell squonk mods options around, but not a few use the more capable 21700s. Until we get more dual or triple 18650 options, this should fill a gap in the market. This new version adds the ‘oh so delicious’ squonk option that many of us have been longing for. Besides, the combo RDA triangle features an easy build double gold-plated Triangle deck. A big fire button and leakproof squonk bottle gives extra point to that. With the side airflow to coil, the CAPO Squonk Kit brings you the smooth airflow and dense flavor beyond your expectation. Last edited by Pheric; 20-10-17 at 09:05 PM.